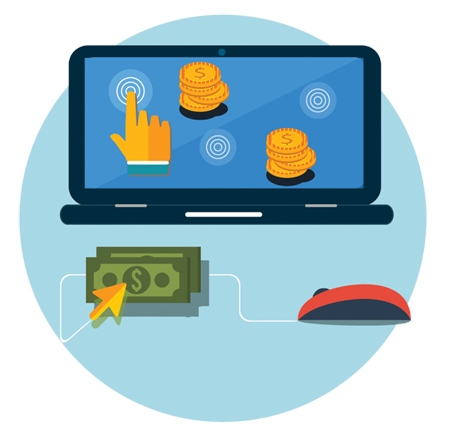 Get the best ROI with an effective PPC solution. Pay per click service is a kind of internet marketing where advertisers pay an amount of money every time if one of their advertisements is clicked. People require PPC to market their business but they are not sure from where it is to start. You have reached the right place to accomplish your requirement of Pay per click services. It is the way to buy the visits of visitors to your website rather than earning the visits organically. Pay per click services are known as the form of internet marketing and stands for pay-per-click. As an experienced Pay Per Click Company at Atlantech Global, the marketing team offers a wide range of Adwords management services. Google Adwords management service is the single most popular PPC advertising system in the world. The AdWords platform facilitates your businesses to create the ad campaigns that appear on the most popular search engine Google and other significant Google properties. AdWord campaign runs on a pay-per-click model where users bid on some specific keywords and pay an amount of money for every single click on their advertisements. Each and every time when a search is started, Google usually digs into the pool of AdWord campaigns and selects a set of winners to appear in the valuable advertisement space on its search result page. “Winners” are selected and they are based on a perfect arrangement of factors. It includes the relevance and quality regarding their ad campaigns and chosen keywords, and also the size of their keyword propositions. Get instant resolution with pay per click advertisement solution. Search engines compensate publicists who can make important, cleverly focused on pay-per-click campaigns by charging them less for advertisement clicks. Search engine advertising is a standout with high flexibility amongst the most prominent types of PPC. It enables promoters to offer for advertisement situation in a web index's supported connections when somebody seeks on a keyword that is identified with their business advertising. Set your budget properly to run the PPC ad campaigns. The budget is required according to your necessity of instant solution. If you are seeking an instant solution then the budget gets higher. Once you invest in this campaign, you can have a big profit from it. You have to pay when someone clicks on your advertisement. For every single click, an amount of money is deducted from your account. PPC is an inorganic process that provides you ultimate resolution to generate the traffic of your business online. Target your PPC to place your business on a higher rank successfully. Running a PPC campaign becomes must have a criterion for each kind of business that exists online. It is useful to increase your business growth comparatively fast. If your advertisements and landing pages are helpful and satisfying to the clients, Google charges you less per click, prompting higher benefits for your business. So in the event that you need to begin utilizing PPC, it's vital to figure out how to do it right. At Atlantech Global, you can experience the most reliable and effective PPC services for your business. A great deal goes into building a triumphant PPC battle: from inquiring about and choosing the correct keywords, to sorting out those keywords into advertisement groups and well-organized campaigns, to set up the PPC presentation pages that are upgraded for changes. All the more particularly, who gets the opportunity to show up on the page depends on and publicist's Ad Rank, a metric ascertained by duplicating two key variables – CPC Bid (the most astounding sum a promoter will spend) and Quality Score (an esteem that considers your active clicking factor, significance, and presentation page quality). This framework enables winning promoters to achieve potential clients at a cost that fits their financial plan. It's basically a sort of closeout. Emphasizing on keyword research is a significant criterion of PPC analysis where some specific and target keywords are optimized for a business. The most searched and popular keywords are selected for PPC campaigns. Advertisement creation is another important attribute to run a PPC campaign successfully. Make people aware of your business and keep them properly updated with the usefulness of your brand. PPC account set up is created in a secured procedure so that after each click, a particular amount of money is deducted from your account. So, in this way, you should pay per click to get an ultimate result. Each existing business is looking for an instant profit that is not possible through an organic process. So, they follow an inorganic strategy like PPC for their business growth. PPC campaign is helpful to capture the attention of your prospective customers. While there is any requirement regarding campaign launching, the team Atlantech Global is always dedicated to providing you an ultimate resolution. The team offers high-quality service according to the requirement of monitoring performance. Monitoring is important to make people understand your business. We fulfill your campaign assessment necessity and design the best solution for you. So, if you have such kind of requirement, let us know about it. We ensure you the world-class solution for your existing PPC account. PPC is a kind of requirement to focus on your business growth. Reducing bounce rate, it convinces your customers and turns those visitors into the customers who are searching for your brand/service. Commercials deliberately situated at the best and right side on each real web index like Google©, Yahoo©, and other web crawlers are called pay per snap or PPC ads. PPC is a web advertising procedure that expects you to pay a specific charge each time somebody taps on a PPC promotion your organization set in the outcomes page of a web crawler. For what reason DO I NEED PAY-PER CLICK CAMPAIGNS? How would I do SEM? You open a publicizing account with the web search tools. For instance, Google's advertisement framework is called AdWords. Along these lines, to promote on Google you have to open an AdWords account. At that point, you utilize the AdWords framework to arrange and run your advertisements. The equal framework for Yahoo and Bing is AdCenter from Microsoft. Is there any preferred standpoint to running paid promotions? Yes. To begin with, you can get promotions up and be running quickly. Second, with paid promotions, you thoroughly control the advertisement message and you can transform it whenever. Third, paid advertisements keep running in a larger number of spots than on the web crawler itself. Web indexes like Google have gigantic advertisement appropriation systems, so you get more introductions. We increase your business growth by following the inorganic PPC. So, run your PPC account successfully with us.